Ever since I was a little kid I loved Lamborghinis and the fastest of fast super cars. Back then I didn’t even know what a Silvia or a drift car was. Today though, it’s all I think about. Japanese cars and the turbo or in this case the V8 that pushes them along. The owner, who is a relative of mine came over to NZ a few months before hand. I had never met him before but to think there were other petrol heads in my generation that belonged to my wide spread family was a delight. Out of coincidence, my Mother’s side of the family also lived in the same area as my Father’s side. 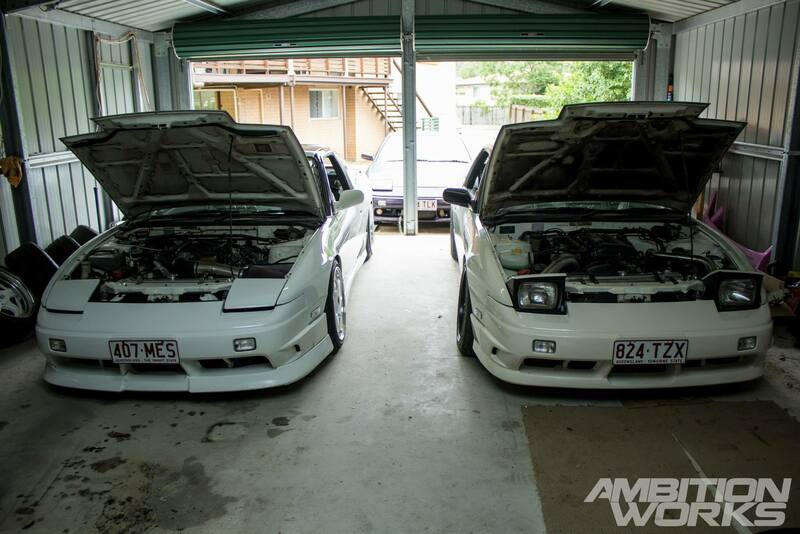 So as soon as I knew I was flying off to Brisbane and the Gold Coast for Christmas, I got hold of my long lost cousin Chris so we could feature one hell of a cross breed Nissan 180SX. Originally, when Chris picked the car off the previous owner it was bone stock. 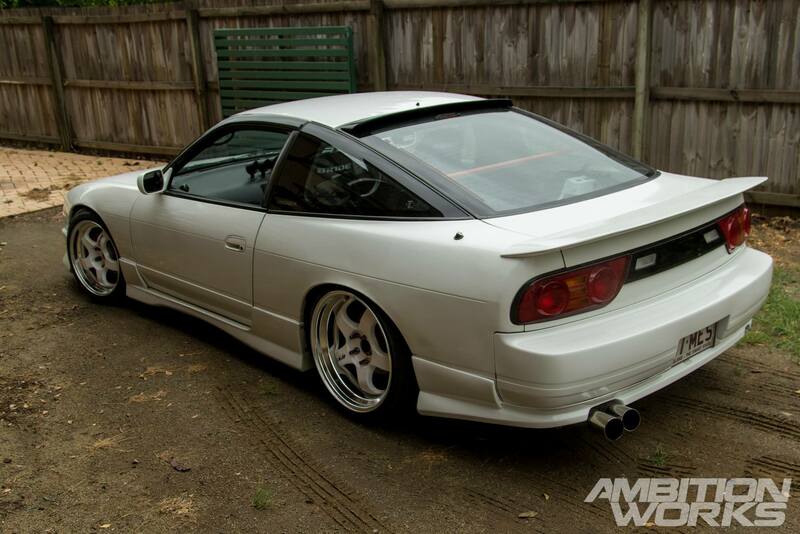 Then he decided to do the usual modifications you’d find in a amatuar drift 180SX. After the first set of modifications it was running an SR20DET engine backed by the RB25 gearbox with custom a made bellhousing. 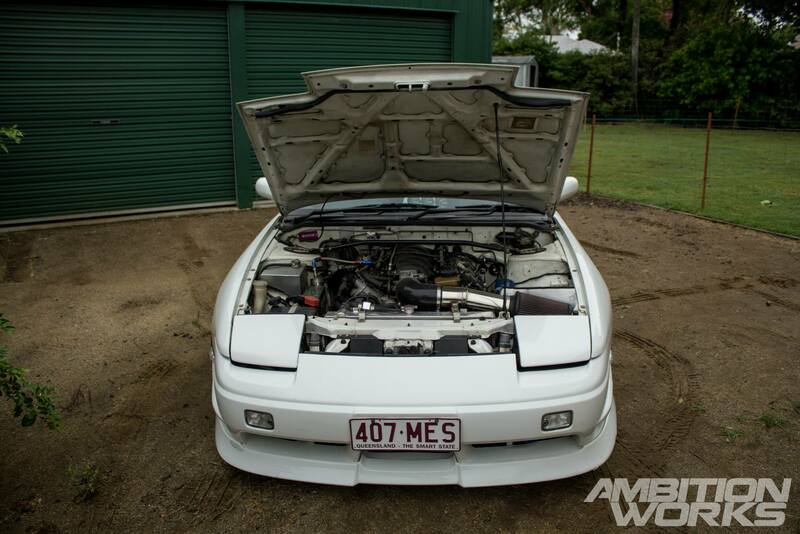 A T28 turbo, 740cc Injectors and a Z32 air flow metre were also in the mix. 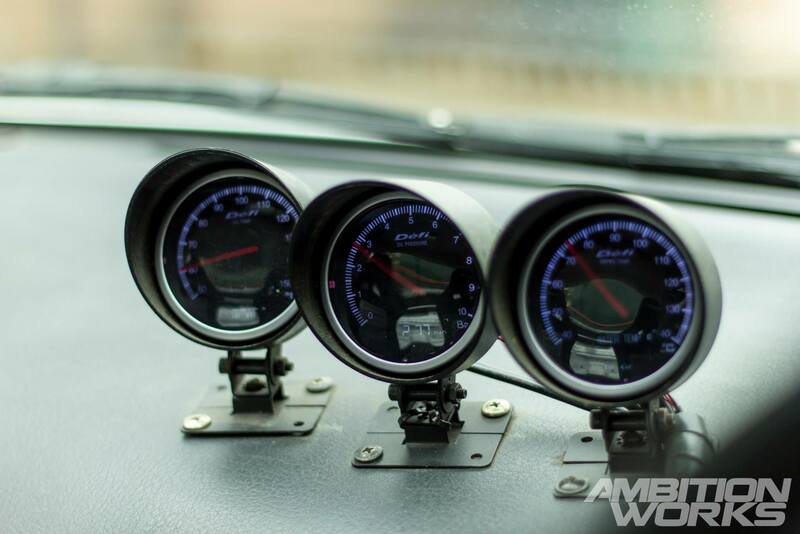 This setup was tuned to 185kw but it just wasn’t enough power for Chris and his addiction to drifting. Personally this is one of the tidiest drift cars I’ve seen for a while in its flesh and bones. Chris even has mod plates for the new engine hiding under in the boot. With drifting skyrocketing in popularity in the past 10 years it’s nice to see people still taking the effort to build something themselves rather than paying someone else to do the work for them. I know not everyone has the time and skills to do it themselves and I understand that there are reasons for paying someone else to do modifications. There’s just something that little bit better about a car that has been built and not bought. 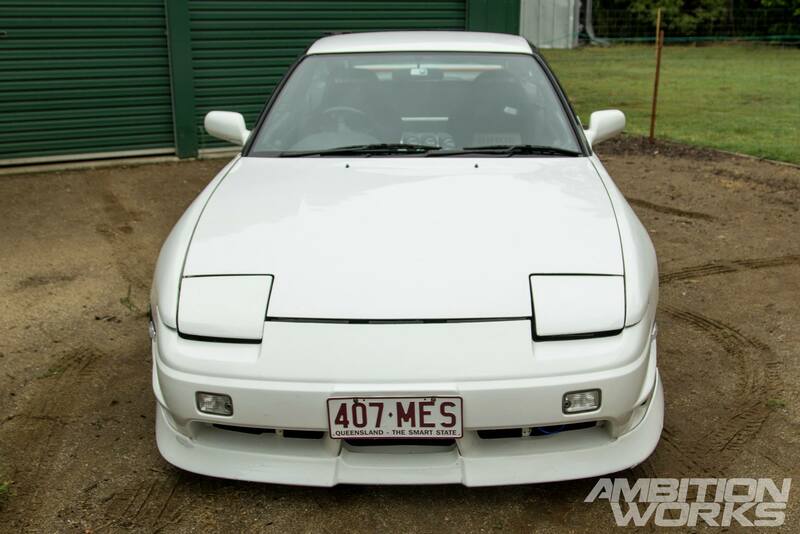 The 180SX has stood the test of time, with about 10 years in production with the same body shape just a slightly changed engine. So what made Nissan keep producing the same car for such a long time with only minor improvements every so often? 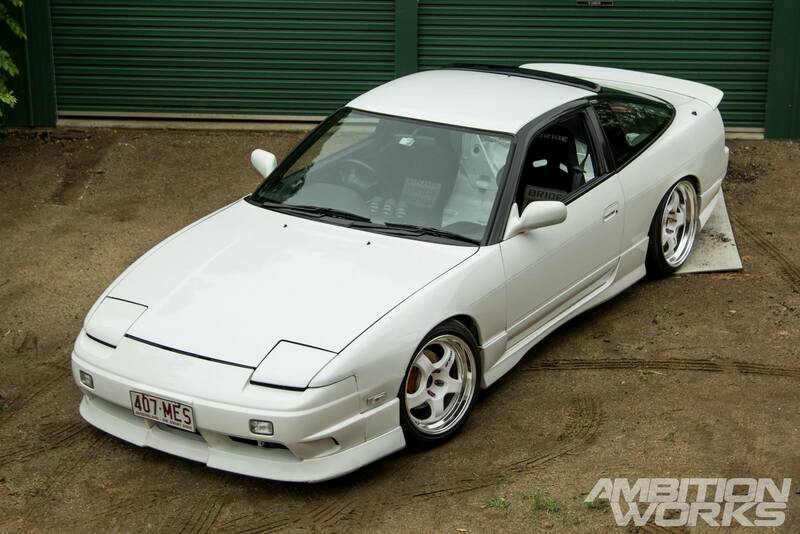 Could it be the Type X kit that changes the looks dramatically, or the fastback look to the rear end. Maybe it’s the futuristic space age feel on the inside that Nissan was going for. What ever it was that made Nissan produce a wicked car for such a long period of time, I’m not going to complain! 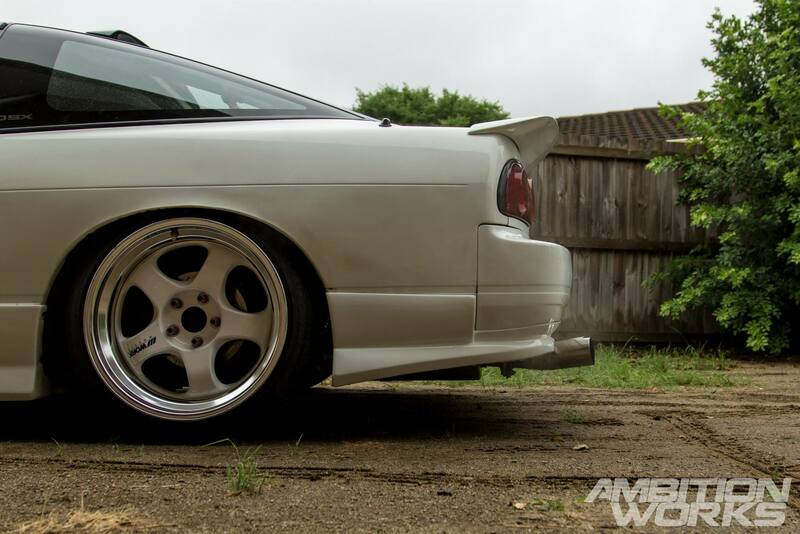 To keep everything still and solid while drifting, Chris had swapped out the factory suspension components and installed a whole set of Project D items along side with HKS coilover. He also had modified the front knuckles and also altered the engine crossmember to fit the new heart. It was about midday during this shoot, the rain was holding off so we were lucky, but the car wasn’t able to get out on the road. This meant shooting in a tight space, it wasn’t all bad though. As Chris slowley drove the car out of their garage, I could hear what engine was rumbling on inside and it was easily loud enough to disturb the neighbours midday nap! 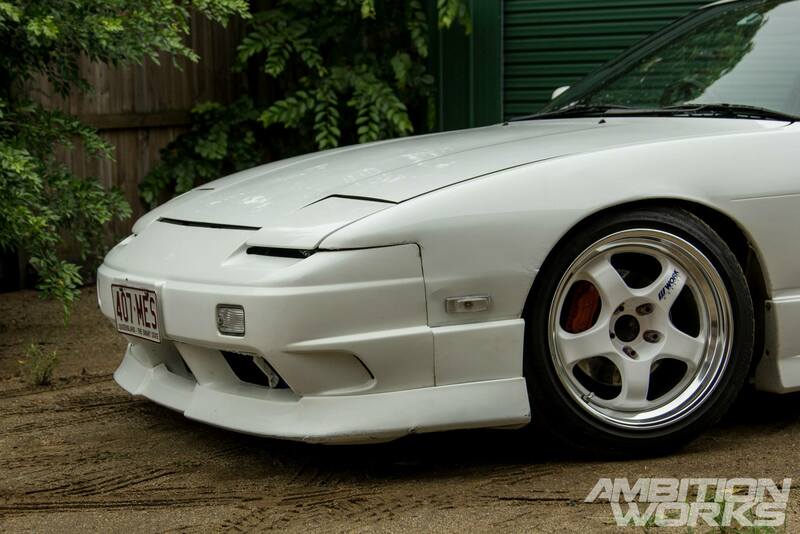 Fitted up to the body of the car are many plastic goodies including genuine Type X front bumper, lip and side skirts. A G-Grow rear lip with a D-max boot spoiler and sitting a little higher a Origin roof spoiler. Chris used to drive this 180SX everyday until it just became impractical, to low to loud and too many cops giving him the eye. So this once daily driver drift car ended up going under the knife and turning into a still street legal drift car. The American dream packed into a little Nissan sports car. Built custom for this car sits a 2.5” twin exhaust exhaling through two 3” tips with a Varex system hiding somewhere inside. With a flick of a switch the neighbours would turn from annoyed citizens to happy campers. 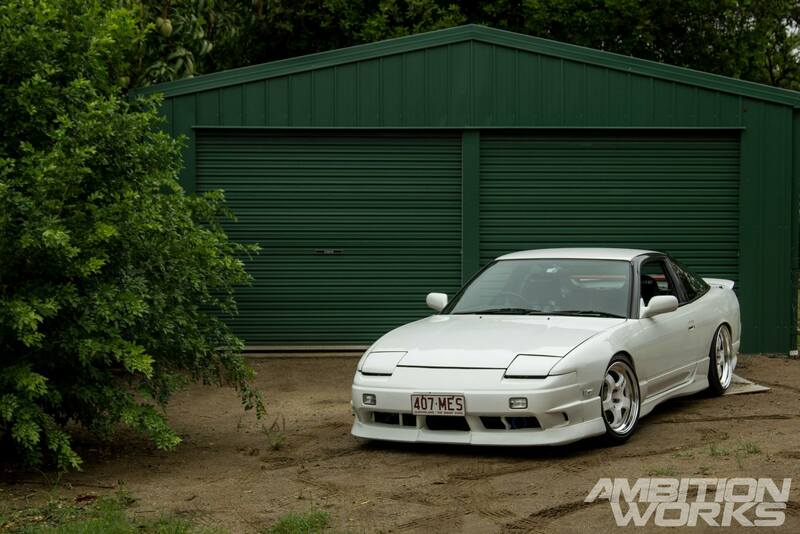 Funnily enough, before turning up I thought I’d only be welcomed by the white on white 180SX. To my surprise there were 3 180s on the property. 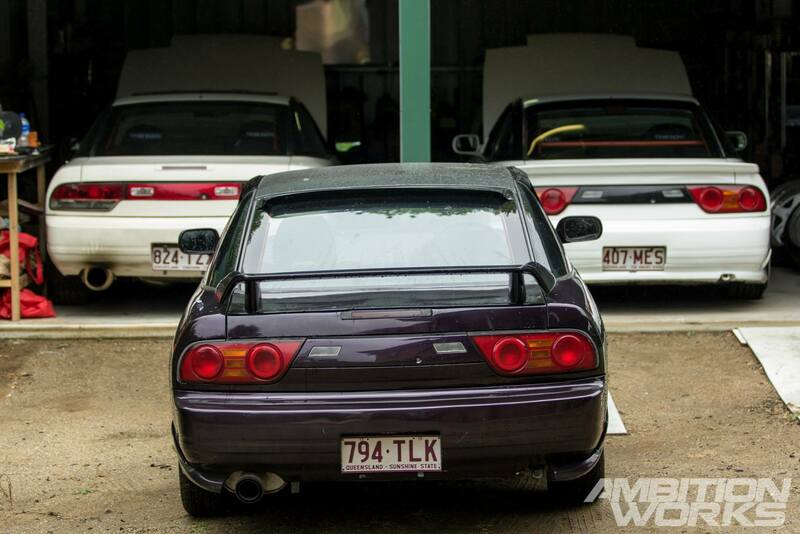 The one on the right is his flatmates drift car running an SR20DET, and the purple one hiding out the back is Chris’ problem solving when he needed to purchase a new daily driver! Under the bonnet of Chris’ track weapon lies a 5.7L LS1 V8. Being held in place by Sikky engine mounts and using a Sikky sump as well. He’s also rather in love with work meister wheels. 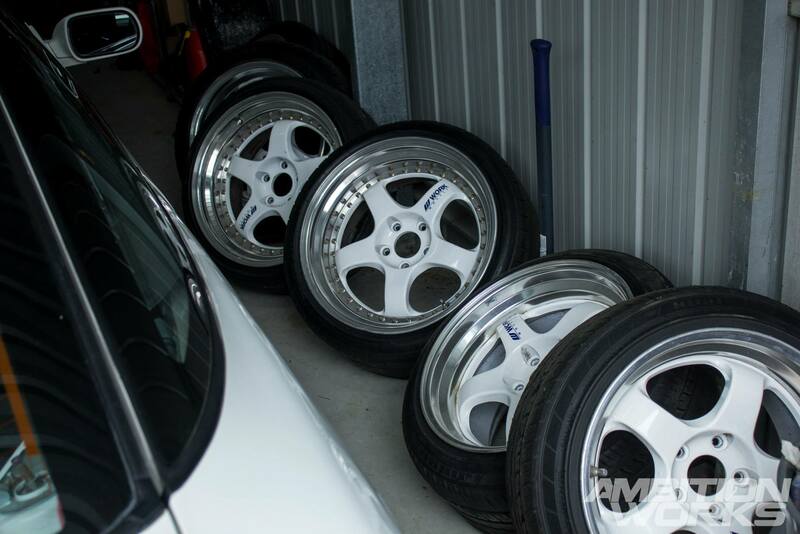 A set of 17×9 +18 and a set of 17×10 +35 S1 2 piece wheels. These are just his drift wheels that are used to burn rubber on in the weekend. All genuine, no fake replicas around this garage. Hiding further back in the corner was another pair this time 3 piece S1 Work Meisters. 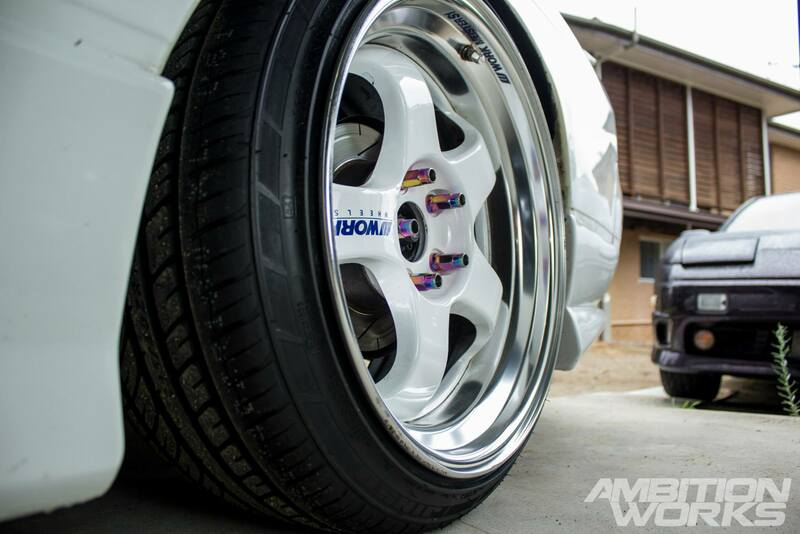 18×9 +22 sizing. 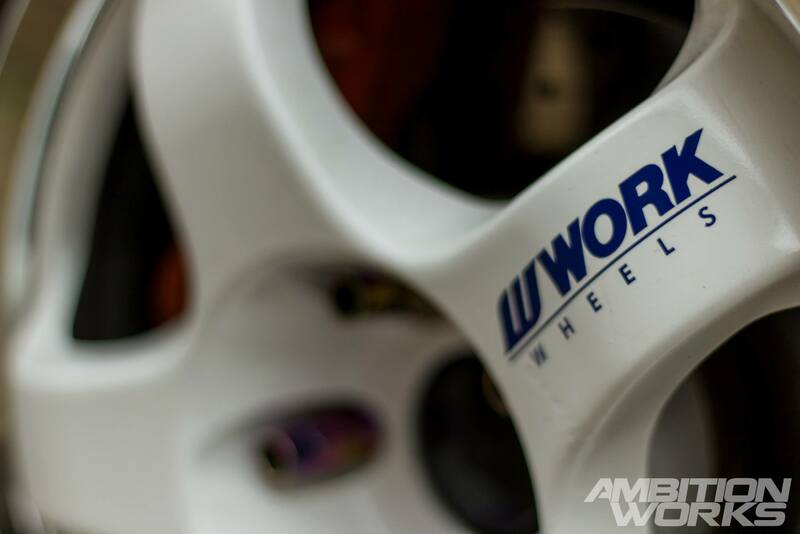 With this many Work wheels how could you ever be sad? I think Type X lights have to be one of the must have upgraded OEM parts for the 180. It just does wonders for the rear end. I don’t know how they do it but they do and they do it well. 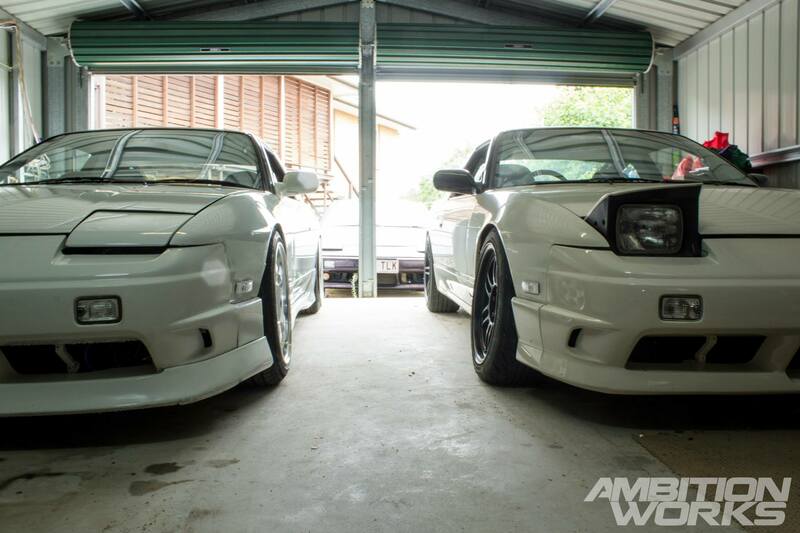 Back outside again and getting into the detail of the V8 swapped 180SX currently making around 300 horsepower. The engine sports a CRS starter motor relocation kit, modified HSV headers, a 3.5” intake and a mafless tune. 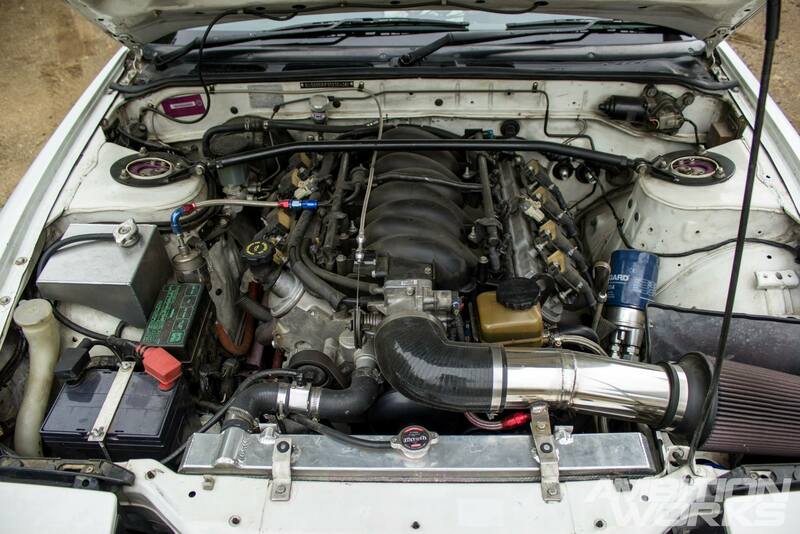 Many people don’t like having a V8 sitting in the body of a Nissan, but why not? The V8 delivers a good amount of horsepower with not much modification, it’s also reliable and consistent horsepower. It’s not overly heavy either. The V8 is connected to a 6 speed T56 Tremec gearbox with a 5 Puk clutch, 1 piece tailshaft and a factory Nismo 2 way differential. The interior has had a little make over with three defi styled gauges, a custom reverse swing clutch pedal to work with the newly swapped LS1 V8. A fully stripped rear with the addition of a strut brace and C pillar brace to increase stiffness. With so many amazing cars in Australia it’s hard to choose one that tops them all, I’d have to say however that Chris’ is certainly up there with the best. It looks and drives the part too. During the whole shoot, the rain stayed away which was lucky for us, a few minutes after I left it started to bucket down. The rain didn’t hold back my spirit though, with many more cars to see and shoot I wasn’t going to let a little rain stop me. Thanks to Chris for letting us spend a few hours walking around your car and having my eyes pop out with jealousy. Until next time!